The geotools-users email list is a great place to start out; ask questions and share tips and tricks on using the library. The users list is for questions regarding the installation or use of the GeoTools2 library. Users of GeoTools are usually Java developers building applications with spatial capabilities. Sometimes, some small applications or server-side code will exist within the GeoTools code base (for example, a Web Map Service implementation or a conversion utility). If these have not yet found a project of their own, then questions about how to use them may be directed to this list. The GeoTools community is available on IRC for a little bit of Question and Answer. You can often find active developers, helpful users, and all manner of activity. If you are new to IRC, you will need to find an IRC client (Pidgin, mIRC, or even Colloquy on mac). A recent fad is the advent of question and answer forums, while these websites are not an official means of communication they do offer an advantage over the traditional email list in that good answers can be voted relevant. If you find nobody is answering send a email to the user list. If you seriously have a deadline, or find you are spending too much time reading this documentation please consider setting up a support contract with any of the following organisations. Please consider this as an option, especially if you do not have a background in Geospatial Science or stuck between a bug and a deadline. Remember that the documentation is constructed by volunteers, or people like you hiring an organisation to for specific work. 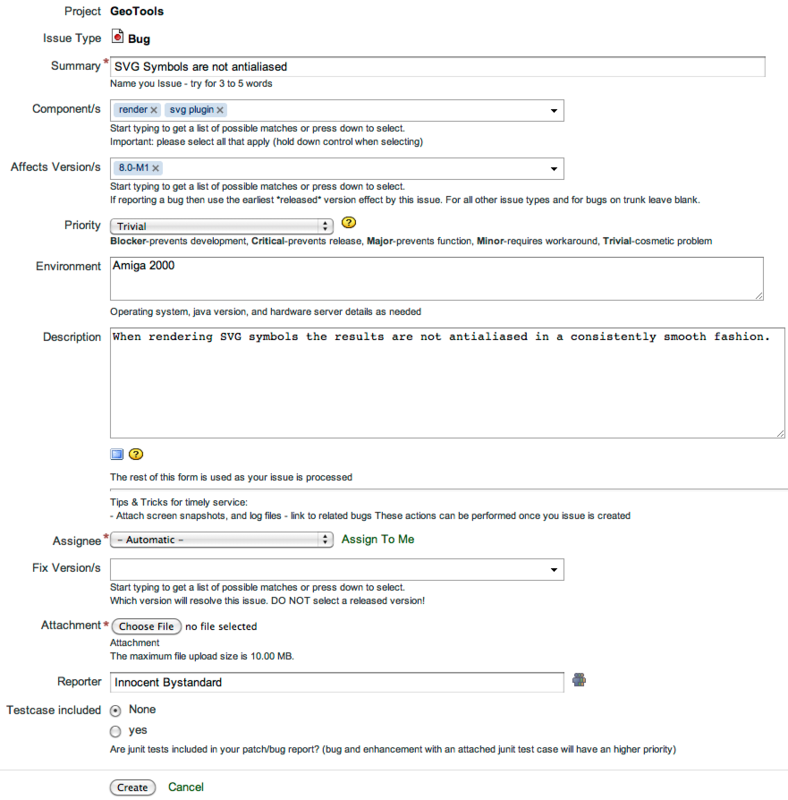 GeoTools tracks tasks, issues and bugs with its JIRA tracker, generously provided by OSGeo and hosted by Atlassian. This is where all bugs should be reported, in addition to requested features and improvements. If this is your first time you can [create an account](https://osgeo-org.atlassian.net/admin/users/sign-up) using the link at the bottom of the Sign In screen. When creating a new issue be sure to fill out all the relevant fields. Example code that reproduces the problem? A stack trace indicating where the failure occurred? The Java Version and operating system you are using? 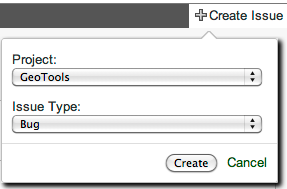 On creation a notification will automatically be sent to the geotools-devel list. JIRA sends notifications for everything done on the issue, to the reporter, the assignee, and to anyone who clicks on the link to ‘watch’ an issue. Note: This is why you must sign up for an account, so that JIRA can email you when updates are done. Your email will not be used for anything else. One nice little feature of JIRA is that if you reply to the email sent for notification, then the reply will show up as a comment on the issue. When will your bug be fixed? the Amiga 2000 does not support java? And then the bug will be “CANNOT REPRODUCE”, and Jira will tell you about that too. For New Bugs we may need assistance to reproduce the issue before a fix can be considered. Usually the a Developer (or the Module Maintainer) will need to ask you for more information. Until they can reproduce your issue, or you volunteer to test, not much is going to happen. Example: If you are on some exotic hardware (like oracle on windows server) that we do not have public access to you will probably need to arrange to meet on IRC and test out different solutions with a developer. For new bugs with a Patch. You can attach a code patch to the Jira task and ask the module maintainer to include your fix in the next release. For fixes: please include a JUnit test case showing that your fix does something. If a developer needs to spend 30 mins reproducing your problem in order to show your fix addresses the issue it will be put off for another day. For improvements: You may be asked to attend a IRC chat to thrash out ideas on how best to include you great idea. Remember that even volunteering to test makes a HUGE difference for developers .. it literally cuts down the work by two thirds! Even if you cannot test right away, swapping messages on email or trying out nightly builds can make a difference. Keep in mind that many members of the GeoTools library have a day job. Just as you volunteer your time to report an issue, they volunteer their time to support the library.